PSMSWG: A Solution In Search of a Problem? Details are still forthcoming for the 51st Sainte-Marie show in June, but we thought we'd point to our friend Alain Martaud's limited-edition book, The Minerals of Sainte-Marie-aux-Mines. Alain discovered the Sainte-Marie mining district at age 14 and over the years has built strong relationships with collectors and museums, allowing the reader to access to a treasure trove of specimens and more. The book is available from the show's online store. GIA is celebrating its four-score years as an institution with a gala exhibition, "The Beauty of Science: Gems and Gemology Celebrates 80 Years, Featuring the Artistry of Harold & Erica Van Pelt." The show, for which a reception was held last week, assembles jewelry, gems, minerals and sculptures that have graced the cover of Gems & Gemology, as photographed by the Van Pelts. In case you didn't see the above-pictured preview of cover and cover star at Tucson, now is your chance—through December 2014—to view fifteen side-by-side examples of arresting artistry. The Van Pelts' work appeared on 93 covers over nearly three of GIA's eight decades, from 1981 to 2009. Quoted in a press release, Erica Van Pelt said, "In our work with G&G, we were able to photograph some of the finest, most valuable, and most unusual gems, minerals, and jewelry in the world. It was both a challenge and a privilege. We are delighted to be part of this exhibit honoring G&G’s 80th anniversary." The pieces being exhibited are on loan from several individuals and institutions, including the Smithsonian Institution, the Van Pelts, The Collector Fine Jewelry, Pala International and private collectors. You can take a virtual (and pixelated) tour of some of the exhibition with GIA instructor Larry Larson via Fox 5 San Diego: look in video 1 at 2:18 for Pala's blue-cap tourmaline, and the above-pictured suite at 4:07; video 2 features gorgeous emeralds and a lovely vase carved from a single piece of multicolored jadeite. In 2001, when Vincent Pardieu, now senior manager of field gemology at GIA's Bangkok laboratory, was still a gemology student in Yangon, Burma, he was shown some remarkable red spinel crystals. The spinels led to his very first field expedition, not to Mogok but to Namya, east of the jade mine at Hpakant, in Kachin state. The next year he was hired to find a bright, 10-carat spinel from Namya, but learned to beware inferior stones' "dark side," thereby dubbing his quarry the "Jedi" spinels, after one of the Star Wars films. From there his quest took him to Mogok and beyond. Read the entire story in the current edition of Gems & Gemology, entitled "Hunting for 'Jedi' Spinels in Mogok." Currently at the Montreal Museum of Fine Arts is "Fabergé, Jeweller to the Czars," the first Canadian exhibition ever devoted to Fabergé. Works exhibited come from the Virginia Museum of Fine Arts (VMFA), the largest Fabergé collection outside of Russia. The Fabergés' association with jewelry and the Russian Tsars begins with father Gustav who, according to RussArtNet, apprenticed to Andreas Ferdinand Spiegel in St. Petersburg and worked for Johann Wilhelm Keibel in the 1830s. In 1941, he achieved master status and opened a workshop by the Fabergé name in a St. Petersburg cellar the next year. After marrying that same year, to Charlotte Jungstedt, the couple had several children, including Peter Carl in 1846. Carl Fabergé (1846–1920), as he is best known, studied and apprenticed in Dresden, Britain, Italy and France before returning to his father's workshop in the 1870s, training there with Peter Hiskias Pendin. With Pendin he assumed ownership of his father's workshop in 1882 and hired his younger son Agathon as a designer. Three years later he received the title of official purveyor to the imperial court, the first of a series of laurels that can be accessed at RussArtNet. The exhibition also features a wealth of documentation on the history and traditions of Orthodox Russia, on the techniques of the House of Fabergé and those who forged its works, and on the fall of the czarist regime which brought about that of the jeweller. The enamelled picture frames, the gold jewellery encrusted with precious stones, the miniature hardstone animals, the rock-crystal flower vases, the silverware and the icons give a picture of the luxurious lifestyle of the time of the czars in a layout designed by Hubert Le Gall. The work of French desinger Le Gall is worthy of its own exhibition; sometimes whimsical, often elegant, always interesting. "Fabergé, Jeweller to the Stars" is up through October 5, 2014. A candid shot or two from the AGTA GemFair held in Las Vegas May 29 through June 2. What happens in Vegas… The boss takes a bathroom break and this is what happens? Pala International continues its quest to bring fine Russian demantoids into the U.S. markets and beyond. As one source for demantoids seemed to be drying up, a new source has emerged in recent years providing Pala with a new selection of gem-quality material. From electric green melée to world class 10-carat sizes—mining in Russia's Ural Mountains is heating up again. Via our mining projects, which spanned from 1997 to 2004, Pala has unearthed, processed and sold massive amounts of Russian demantoid around the world. 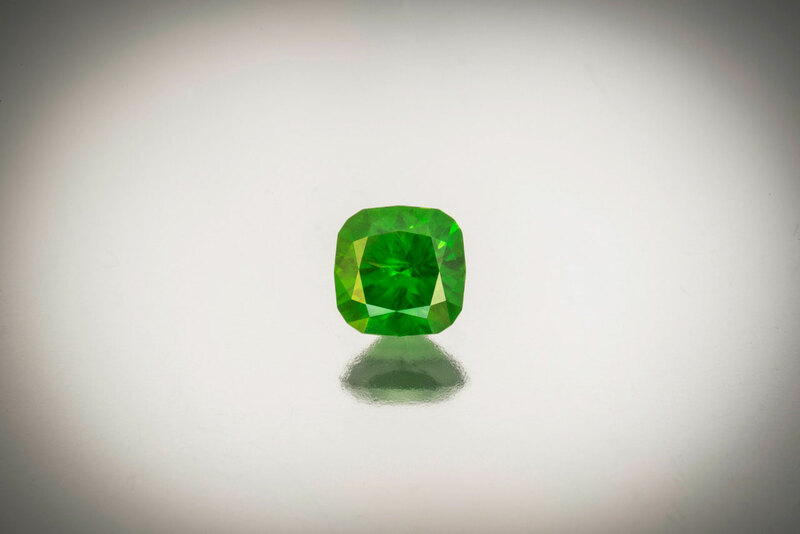 As our demantoid inventory has been depleted over the years this recent influx of exceptional gems has elevated our stock again and caught the eyes of demantoid connoisseurs. This month we feature a couple of outstanding demantoids from our new source. The first is a 2.09-carat square cushion-cut with an electric green hue. This is a top color for demantoid, even taking on a neon lime-green glow in the daylight. Upon closer inspection the silky feel of the stone reveals an amazing horsetail spray radiating from the center. 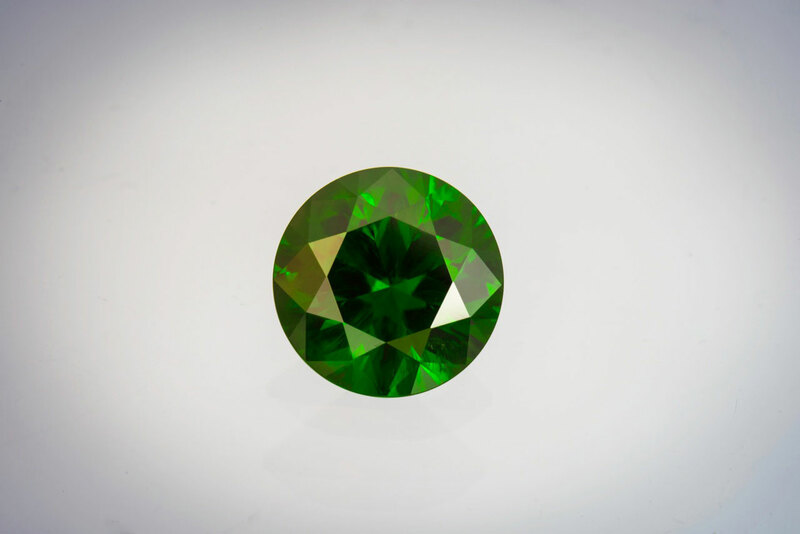 The second demantoid is a world-class 9.61-carat round brilliant. Even fine 2-carat Russian demantoids can be scarce, so to have such a massive gem is beyond rare. On top of that the color is a rich saturated evergreen that opens up in the daylight. This stone also has interesting inclusions including the classic horsetail sprays. A true wonder of nature on the inside and a feast for the eyes on the outside. Over the years we have looked at several studies by Dr. Karl Schmetzer of natural and synthetic chrysoberyl, especially the alexandrite variety, regarding which he has written the definitive reference. This month we review "Purple to Reddish Purple Chrysoberyl from Brazil," co-authored with Jaroslav Hyršl, Heinz-Jürgen Bernhardt and Thomas Hainschwang, and appearing in Journal of Gemmology, 34(1), 2014, pp. 32–40 (abstract). Search on "Minas Gerais" in Mindat and you will receive scores of hits, so rich is this state in gems and minerals, including alexandrite, which was discovered in 1975 near the town of Malacacheta in the eastern area of the state. Rare purple to reddish purple chrysoberyl (aka "red" chrysoberyl) from Malacacheta has only briefly been discussed prior to the present study. In this study, Dr. Schmetzer and his colleagues begin with a summary of pleochroism and color-change of typical chromium-bearing chrysoberyl, i.e. alexandrite. The new study's two samples consisted of a 1.91-carat twinned crystal obtained in the Malacacheta area and a 0.49-carat faceted stone from a private collection with the locality of "Brazil." The faceted chrysoberyl, which measured 2.4 mm in thickness, was compared with a 0.11-carat alexandrite from Hematita, not far from Malacacheta, a thickness of 1.8 mm. The alexandrite displayed purple in incandescent light and intense blue-green in daylight. In comparison the crystal and cut stone appear very dark violet-purple or purple in reflected daylight and reddish purple or red-purple in reflected incandescent light, as shown below, whereas fiber-optic illumination showed them to be nicely transparent and intensely colored. As can be seen from the images above, the crystal specimen is twinned. The morphology is described in the report and is found to represent growth "that is typical for pegmatitic chrysoberyl from many localities, such as Sri Lanka." The faceted stone also is twinned, as is shown in the study using immersion and two different lighting methods. It contains birefringent platelets, which previously have been described in Malacacheta alexandrite, but are not usually seen in Hematita samples. The growth structures in the reddish purple chrysoberyl samples also differ from those seen in Hematita alexandrite, but are similar to Malacacheta alexandrites. Given that both samples are twinned, the researchers were unable, without immersion, to view them parallel to each of the a, b and c axes so that light could pass through a single individual of the twin. Using the immersion microscope, enhanced by polarized light, it was possible to achieve the optimum light path in order to correctly observe the colors of X, Y and Z. The greatest divergence of the reddish purple chrysoberyl samples from typical alexandrite was found for Y in polarized light, being yellowish orange in daylight and reddish orange in incandescent light for the former samples, compared with yellow-green or yellowish green in daylight and yellow-orange to orange in incandescent light for typical alexandrite. Chemical and spectroscopic analysis found chromium levels to be much higher in the two reddish purple chrysoberyls than for the Hematita alexandrite. As stated in the report's abstract, "The high Cr content is responsible for a reduced transmission in the blue-green range of the visible spectrum, which causes a shift in the daylight coloration from blue-green for typical Cr-bearing chrysoberyl (alexandrite) to violet-purple or purple for such samples with distinctly higher Cr values." If more aluminium in the chrysoberyl structure is replaced by chromium, a new mineral is formed, which was recently discovered in the emerald-alexandrite deposits in the Urals, Russia. The name of this non-gem mineral is mariinskite. Iron levels in the two specimens were found to be similar to alexandrites from the Hematita. Because the duo's inclusion pattern, growth structures and trace-element levels are consistent with Malacacheta alexandrites, and inconsistent with those of Hematita alexandrites, the authors concluded that the latter locality was an unlikely origin for the reddish purple chrysoberyls. One feature not yet mentioned above, but which is obvious from the image of the reddish purple crystal is its colorless overgrowth. The authors remark that colorless chrysoberyl are very rare, mainly coming from Sri Lanka and Burma's Mogok. Such a colorless overgrowth on a dark, chromium rich core was hitherto unknown to the authors. This distinct color zoning indicates two different growth steps for the twinned crystal. For the colored gemstone enthusiast, curiosity is piqued regarding this rare material when the authors provide this tempting appraisal: "The colour and colour variation between daylight and incandescent light resemble some dark purple or purplish red garnets of the pyrope-almandine series, or some purplish rubies." On May 27, the four-year ordeal of Ann Maxim Patton, accused of killing her husband John Felix Bender in their home in a Costa Rica jungle, ended with her conviction. In the course of investigating Bender's death, police found "undocumented gems" worth millions, according to Outside magazine writer Ned Zeman's 8500-word article on the case published a year ago. Bender had been a Wall Street billionaire, meeting Patton in 1998. The two found they both had a love of animals and conservation. In 2000 they moved to Costa Rica after having only visited previously. By October of 2004 they had built a massive 80,000-square-foot home with an Olympic-sized bedroom (see video), where Bender died in 2010 amid a collection of 550 Tiffany lamps. Their property also included an animal refuge and a preserve on which a new species of orchid was discovered. Still image from a Spanish-language video report by Costa Rica's Repretel media firm. The report takes the viewer through the lavish home of Ann Patton and John Bender as well as to a brief interview with Patton, posted a week before her conviction. Both partners battled bipolar disorder, and Patton claimed to have Lyme disease amongst other ailments. After the death of her husband she had more challenges: she was accused of smuggling the gems. According to writer Zeman, diamonds, rubies and opals had been found by the investigators, some in custom-made display cases, others lying on counters or squirreled away in backpacks. None were accompanied by receipts or evidence of tariffs paid, although Patton told Zeman she could produce the paperwork. She showed Zeman photos that the police had taken to catalog the collection—a red diamond bought in a 2.2-million-dollar lot, diamonds and opals valued at $8.5 million—$15 million in all. Patton was acquitted in a January 2013 trial. "With good reason," Zeman wrote, since the prosecution provided little evidence, no motive and much speculation. But prosecutors appealed; a new trial began May 19 this year. The English-language Costa Rica online newspaper Tico Timesoutlined the prosecution's new case—still minus a motive—which convinced three judges of her guilt. She was sentenced to 22 years in prison, but first was remanded to a psychiatric facility for preventive detention. According to a "Free Ann" website, she was transferred to prison ten days ago. In March we noted the formation of a relatively new trade group known as the Precious Stones Multi-Stakeholder Working Group (PSMSWG), billing itself as "an open, non-exclusive coalition of companies, associations, NGOs and governments sharing an interest in responsible sourcing and supply-chain due diligence for precious stones." The group is investigating application of due diligence guidelines by entities such as the Organisation for Economic Cooperation and Development (OECD). The intent is to mirror existing guidelines regarding the responsible sourcing of tin, tantalum, tungsten and gold. Given that Signet, a major stakeholder that does 75% of its business in diamonds via brands like Jared, and given also the prominent presence of the State Department, the working group's efforts are seen by some as an indirect attempt to enhance the Kimberly Process. According to the summary of a meeting held May 26 in Paris, organized by the PSMSWG, the aim is to break the links between minerals and violent conflict and human rights abuse. The summary then goes into elements and issues of due diligence, process and next steps. What seemed to be missing in the background section, however, are any examples emblematic of the need for such guidelines in the first place. Here's an example, an article published last month by the Canadian newsweekly Maclean's with the lurid headlines (Web posts often have more than one), "Blood stones: Terrorism, drug smuggling and Pakistan's gemstone trade / The dangerous world of Pakistan's gem trade." The article's author Adnan Khan, who has penned a string of doom-and-gloom pieces for Maclean's, also posted a video covering the same subject. After suggesting that laundered cash from gemstones mined in a Taliban-controlled village is packing the arsenals and storehouses of Taliban commanders, Khan discussed the problem with Muneer Ahmad, an investigator with Pakistan's financial monitoring unit, but Ahmad couldn't be bothered because the problem is too small, relatively speaking. Direct from Peshawar, 799 ct for a ten-spot offered on eBay. Alas, this sale "was ended by the seller because there was an error in the listing." Khan's article goes on to discuss Afghan emeralds winding up in Colombia, being passed off as Colombian; Afghan rubies showing up in Bangkok being marketed as Burmese. A problem, yes, but not of the human rights variety. Assuming that there is a mine-to-market verification need, PSMSWG is set up to explore methodology. In pursuit of this goal, a draft report was prepared and was supposed to be issued last month in Paris. We're told it was so poorly written and documented that the PSMSWG sent it back for major revision and did not present it in Paris. The new draft is scheduled to be prepared in two months for eventual presentation to the OECD. Issues that we reported on in March still remain, with more being articulated in particular by Dana Schorr, a member of the organization's Communications Committee. "I have asked for a set of all the minutes of the Committee," he told us last Thursday. "After four months I'm still waiting." Schorr has been sending out his own communications to interested parties. We received eight in May alone including concerns raised by ICA, AGTA, Antwerp World Diamond Center, CIBJO President Dr. Gaetano Cavalieri about being edged out of the "non-exclusive coalition" in one way or another. On May 19, a week prior to the Paris meeting and also a prospective confab at the Las Vegas show, Schorr issued eight questions he hoped might be addressed. Only No. 8 was answered, in the negative. "Leaders of PSMSWG constantly state that they are not interested in, nor promoting, new due diligence or legislation," Schorr told us. "There is no other reason to involve OECD," which has taken part in PSMSWG negotiations, "except to get new due diligence and legislation." Petra Diamonds, owner of the Cullinan mine in South Africa, chose Friday the 13th to announce the "recovery" of a remarkable blue diamond. At 122.52 carats, it could vie for the top spot in the pantheon of blue rough, but JCK mentions a 620.14-carat light blue that was found in South Africa in 1984, and that the Hope is estimated to have come from a rough of 112 carats. The rough will not be sold before the end of Petra's fiscal year, June 30, because it's value cannot be assessed without further study. Petra provided the following list of important blues uncovered since acquiring the Cullinan mine in 2008. A 39.9 carat diamond which sold for US$8.8 million (or US$220,551 per carat) in 2008. A 26.6 carat diamond which yielded a fancy vivid blue and internally flawless 7.0 carat polished stone. Sold for US$9.49 million (or US$1.35 million per carat) at a Sotheby's auction in 2009; at the time this was the highest price per carat for any gemstone sold at auction and the highest price for a fancy vivid blue diamond sold at auction. It was subsequently named the 'Star of Josephine' by its new owner. A 25.5 carat diamond which sold for US$16.9 million (or US$663,144 per carat) in 2013. A 29.6 carat diamond which sold for US$25.6 million (or US$862,780 per carat) in February 2014. JCK points to a Reuters piece that quotes finnCap analyst Martin Potts as saying he thinks this could be a record-breaker in terms of price. JCK also quotes Natural Color Diamond Association educational director Thomas Gelb as saying this could be the biggest blue faceted diamond ever. As we have noted in this column before, jade mines in Kachin state supposedly were closed in 2012 due to fighting between the Kachin Independence Army (KIA) and government forces. This created a vacuum, filled by thousands of artisanal miners. Now, the government is cracking down in big way. As reported by the Myanmar Times (MT) last week, a President's Office special task force has arrested 1300 miners and seized equipment between mid-March and the end of May. The equipment included 1312 generators, 10 water pumps, 142 stone punch machines and more. Some miners are receiving protection of armed ethnic groups, however and some illegal miners in Hpakant threatened to break into jade storehouses. The President's task force, consisting of police, military and government officials, was mandated on February 2 to take action—and did. The Irrawaddy published a profile of displaced Kachin villagers May 16. They had been told they could return within three months; it's been a year, and no return. National Geographic published a story May 20 reporting that the KIA used to fund its operation by charging a road toll for shipments of gold and jade; now it is for timber trafficking. The trickle in jade from Kachin has caused Mandalay's trading center to slow due to the dearth of fine jade, according to another MT story, May 18. Chinese buyers—key to the success of the market—have been staying away since February. Democratic Voice of Burma on May 28 gave another reason for Mandalay's doldrums: China's suspension of loans to its jade merchants. Yet Hong Kong is taking steps to facilitate even more trade with Burma; it already is Burma's third largest investor. As another May 18 MT story states, Hong Kong is interested in Burma's jade and jewelry, and agricultural products. Also on May 18, MT reported on jade trader's secret weapon that doesn't seem to be doing too well: paying homage to the spirit of the Mother Naga (mother serpent), known as Naga Mae Daw. At the turn of the last century, legend has it, a jade trader visited Wat Kangyeema, near Mandalay, and his daughter was possessed by the serpent spirit, who gave great advice, leading to the traders great fortune in trading. In other jade news, it appears that the Hpakant-Moegaung that was to be paved partly with the cash of gem mining companies will move forward—without the companies' contribution, as reported by MT yesterday. Reluctance on the part of the companies had led to a literal roadblock of their vehicles and a ban or their local sale of jade. Companies appealed to the President, who agreed with them; only the Ministry of Construction will be responsible for the project. On June 2, Eleven Media Group (EMG) reported that the Burma government is planning to exempt small businesses, that earn less than $15,000 a year, from taxes. Also, an export tax set at 30% for raw gems would be suspended. The tax will be replaced with value-added tax. The Ministry of Science and Technology is advocating laws "to protect unique Myanmar products like teak, thanaka (sandalwood), lotus flower, handicrafts, precious stones such as jade and rubies, so that their value might increase in world markets," as stated in a May 30 story by EMG. A protective law may be enacted as soon as this month. June's birthstone is agate, and when we think of this material manipulated by Man we think of the famous agate carvings of Germany's Idar-Oberstein. As noted by the Smithsonian Institution, the cities' production of these carvings ground to a halt in the early 1800s when local supply of agate played out. Fortunately, at about the same time an alternate supply of agate and quartz was found in Brazil. German ships thus were able to ship cargo abroad, bringing back quartz and agate as ballast, reviving a flagging industry. The region had a third boom after World War II, cutting stones from Brazil and also Africa. Today gemstone aficionados are lured to Idar-Oberstein by the Intergem trade fair, which celebrates its 30th year this coming October. This card features an embossed horseshoe studded with agate ovals. Two other collecting cards for June are available here.